Physical therapy is a form of rehabilitative treatment for physical disease or injury that focuses on repairing the musculoskeletal and neuromuscular systems of the human body without recourse to drugs or surgery. With an emphasis on functional restoration, NYDNRehab began providing treatments for physical therapy in New York, including dynamic neuromuscular stabilization, ergonomic therapy, Vojta therapy, virtual-reality therapy, biofeedback training, and a variety of soft-tissue techniques. DNS is an alternative to conventional shoulder therapy. Whereas the majority of shoulder pain therapies rely on strengthening the rotator cuff muscles, DNS begins with restoration of motor control, which allows physicians to reestablish the muscular balance necessary for the joints of the shoulder to function properly. As a child grows, it’s critical that muscular synergies develop to ensure the stability of the arm. This method reenacts that process of development, based on developmental movement principles that stabilize the body by teaching it to internalize the postures a child takes when it’s first learning to crawl and stand upright. This, in turn, helps restore the alignment of the entire neuromuscular skeletal system. Second, physical therapy treats injuries and conditions of the knee like hamstring tendinitis, ligament sprains, patellofemoral syndrome, pre-patellar bursitis, and anterior knee pain. At NYDNRehab, treatment of these conditions begins with technological gait analysis that presents a dynamic evaluation of the kinetic chain of the lower body. The clinic makes use of the Alter-G anti-gravity treadmill designed by NASA. As with gait analysis, the Alter-G is much like a treadmill, and has been used to treat patients suffering the repercussions of stroke, spinal injuries, repetitive use disorders, and neurological conditions. Patients who use the Alter-G treadmill are able to increase their stamina and lower-body weight in a safe and painless environment. Alter-G is surrounded by a vast airtight skirt that is inflated to create an enormous bubble. Air pressure in the bubble is adjusted to counter the weight of the runner by an external digital panel that serves as the control center. This creates an effect that is not unlike running in low gravity. Together, these devices allow athletes to run longer and faster than they would with conventional exercise equipment. By reducing the pressure of the body’s impact, the anti-gravity treadmill removes the patient’s weight from the injured leg, knee, or foot and allows them build muscle tone and accelerate recovery. 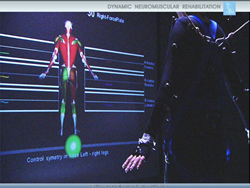 Computer-Assisted Rehabilitation Environment (CAREN) is a multi-sensory virtual reality system. The uniqueness of this system is that it visualizes muscle imbalance and asymmetrical loading, offering the athlete a diagnostically precise evaluation in real time. CAREN measures the motion of a subject in detail as he or she walks along a treadmill in our fully immersive virtual-reality environment. The system enables the creation of a variety of situations that can’t be replicated in a conventional clinical setting to provide precise therapeutic strategies by using a computer-driven motion platform and feedback and feed-forward simulators. In addition to these technologies CAREN employs a projection screen, motion capture, motion base, and human body model (HBM) software to create a totally immersive experience. CAREN has been applied to a wide range of conditions including sports medicine and balance disorders, back pain, and neurological disorders, and successfully rehabilitated injuries for some of the world’s best-known athletes. NYDNRehab is unique among the clinics offering physical therapy in Manhattan because it combines conventional medical treatments and a hands-on approach to health care with advanced modalities available for treating injuries. As a result, the clinic is able to provide not only some of the most personable physical therapy in Manhattan but also cutting-edge rehabilitation and manual medicine treatment. The first outpatient gait lab in New York City, the New York DNR is led by Dr. Lev Kalika, a former student of the Prague Rehabilitation School in the Czech Republic with over 15 years of experience in private practice. Here in New York, physical therapy treatments the clinic offers place an emphasis on restoring function in the individual athlete.